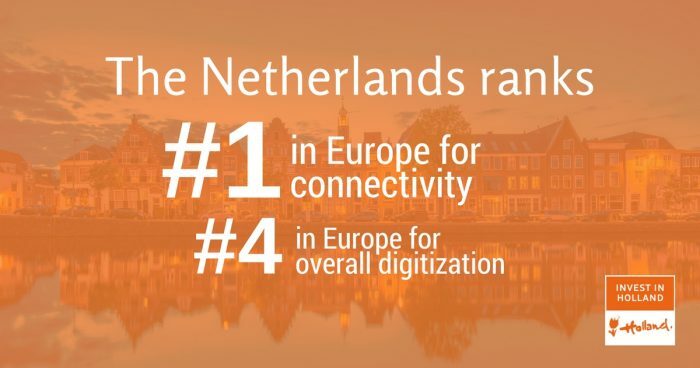 The Netherlands ranks first in the EU for connectivity and fourth in the EU for overall digitization on the 2017 Digital Economy and Society Index (DESI). The Netherlands ranks first in the EU for connectivity and fourth in the EU for overall digitization on the 2017 Digital Economy and Society Index (DESI). Released annually by the European Commission, DESI measures digital progress of European countries based on five different categories. These categories include connectivity, human capital, use of internet, integration of digital technology and digital public services. The Netherlands precedes Belgium, the UK and Ireland on the index. Holland ranks above the European average in all five DESI categories. The country is particularly a leader in fixed broadband, with fast broadband access available to practically every Dutch household. The Dutch are also very well-connected in terms of number of citizens using the internet and their range of online activities. DESI also notes progress in business digitization, ranking sixth in integration of digital technology. In digital public services, the Netherlands ranks third in the EU. As the most connected country in Europe, the Netherlands is a hub for leading information and communications technology companies. In fact, 60 percent of all Forbes 2000 companies active in the IT industry have already established operations in Holland. Global IT companies like Microsoft, Cisco, Oracle, Intel, IBM, Verizon and Google have operations in Holland. Businesses such as these take advantage of the country’s unparalleled digital infrastructure and tech-savvy, English-speaking workforce.